The first and foremost consideration when attempting to tune your glow engine is to understand the basic parts of a nitro vehicle and their functions. Important Note: Make sure to completely break-in your nitro engine prior to tuning the engine for maximum performance. 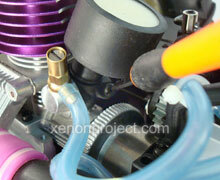 The main function of the carburetor is to create a proper mixture of fuel and air. Once this mixture is achieved, it is sent to the engine to be combusted. The carburetor can be adjusted to control the mixture ratio of gas to air that is fed into the engine. If you increase the amount of fuel in the mixture, you are making the mixture "rich" and alternatively, if you decrease the amount of fuel in the mixture, you are making the mixture "lean". An engine's performance is dependent upon this fuel mixture and is regulated by the carburetor, which, in turn, is regulated by a high speed, low speed, and idle speed setting. Important Note: Make sure to completely break-in your nitro engine prior to tuning the engine for maximum performance. See Breaking in Your New Nitro Vehicle. Important Note: Turn the mixture needles clockwise to create a “lean” mixture and counterclockwise to create a “rich” mixture. A lean fuel mixture will increase engine power, but be wary. Caution: Never run an engine too lean, because it will cut out or begin to stall. This could cause severe engine damage. In order to tune your RC for performance, start with a rich fuel mixture and slowly move towards a lean mixture until the ideal mixture ratio is found. Caution: Never EVER tune from a lean to a rich mixture. There should always be a light stream of smoke coming from the exhaust. This is primary fuel mixture adjustment. It is located next to the air filter, where the fuel line connects to the engine. After the engine is warmed up, gradually lean the high speed mixture by turning it in 1/16 increments clockwise until an ideal mixture is reached. Make several passes with the RC after each adjustment and note any changes in performance. If you are experiencing one or more of these symptoms listed above, slowly richen the mixture by giving the high speed adjustment 1/16th turns counterclockwise until the symptoms disappear. The low speed mixture adjustment is performed only after the high speed needle has been correctly adjusted. The easiest way to adjust the low speed mixture is by doing the "pinch" test. The valve is located where the throttle arm pivots. 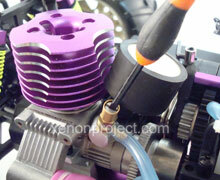 Having set the high speed needle correctly, take the RC vehicle and pinch the fuel line going into the carburetor. The engine should run for about 2-3 seconds, speed up, and die. If the engine runs longer than 3 seconds, give the low speed needle a 1/16 turn clockwise. Run the vehicle again and retest. Repeat as necessary. If the test results in the engine dying immediately, without speeding up, richen the low speed needle by giving it 1/8 turn counter clockwise. Run the vehicle again and retest. Repeat as necessary. Once the low speed needle is correctly adjusted, the engine throttle should respond very quickly. It is now time to adjust the idle speed. This spring tensioned screw is located beneath the oil filter, facing towards the front of the vehicle. In order for an engine to run, it must have enough internal inertia built up in the engine to catalyze the entire ignition cycle. Generally speaking, you want to adjust the idle speed to the slowest idle possible, just before it starts to stall. The key is to set the idle speed as low as possible while still maintaining reliable running characteristics. In order to do this, turn the idle screw counterclockwise to reduce the idle speed. If your engine stalls or cuts out, turn it clockwise to increase it. Remember, the goal is to reach the point that is just before the point where the engine stalls and cuts out. This chart indicates the direction in which you should adjust the fuel mixture when faced with changing conditions. It assumes the engine is currently well tuned. You could face any combination of conditions listed in this chart. Knowing how to adjust the fuel mixture is a crucial part of operating and maintaining your RC vehicle.